For us long-time Upper West Siders, the closure of neighborhood stalwart Dock’s more than a year ago was a sharp blow. Dock’s Oyster Bar was a wonderful seafood joint the excelled at simple preparations of fresh fish at a reasonable price point. They knew how to pour a martini and their ice cream sundae was terrific. The restaurant itself was a classy, white tablecloth saloon that, along with Carmine’s, helped transform the neighborhood. When it suddenly snapped shut, locals were crestfallen. Accademia Di Vino opened in its place some time later. 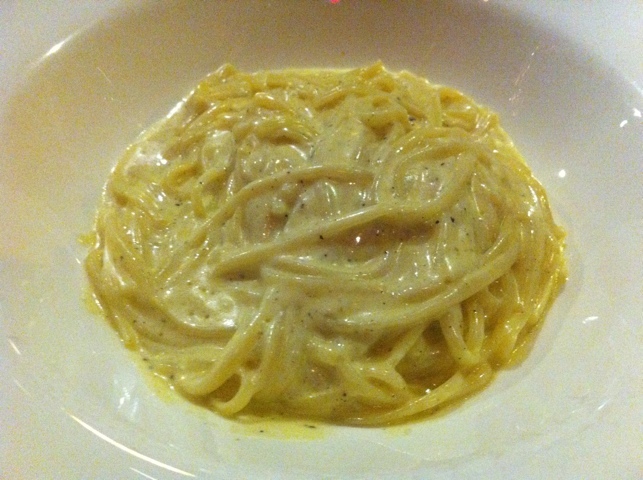 I was at first nervous – an Italian restaurant opening across the street from Carmine’s? However, I was considerably relieved to learn that Barry Corwin was one of the folks behind it. Mr. Corwin was part of the team that brought both Dock’s and Carmine’s to the neighborhood, and knows how to strike the right note and create a winning neighborhood joint. The fritters are pretty decadent. 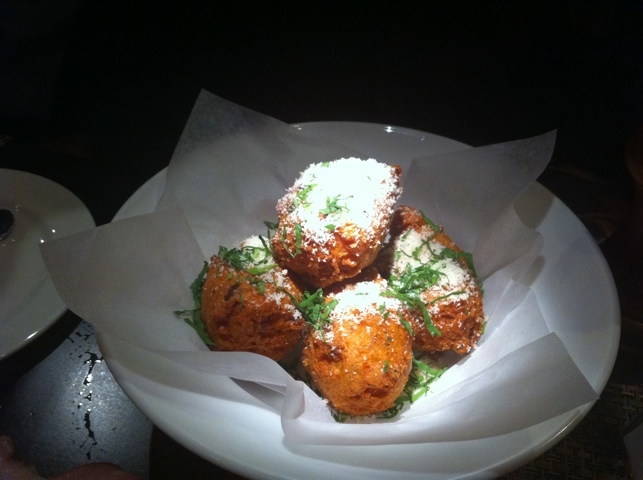 We began with the prosciutto and parmesan fritters as an appetizer. As you can see, they are golden, fried balls, filled with the ingredients in their name. They are served very, very hot (fresh from the fryer, I imagine), topped with a good dusting of parmesan cheese besides. 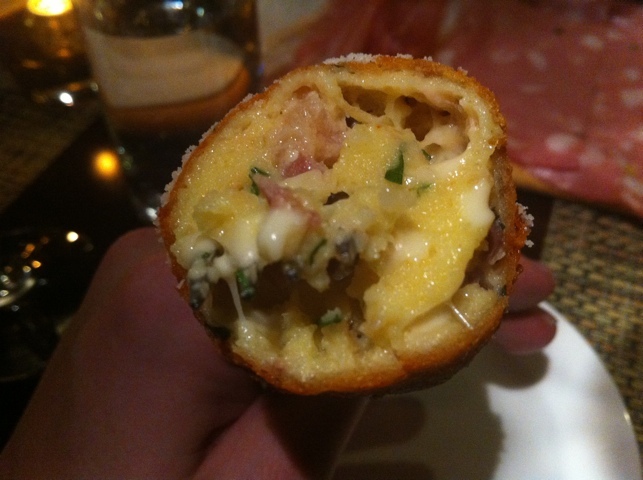 They are very rich, the fat of the prosciutto infusing the parmesan with a mouth-filling comforting flavor that tickles the back of your nasal cavity. Having (relatively recently) returned from a blissful trip to Italy, I can tell you that the parmesan there bears little resemblance to what we get here in the states. However, this mix of flavors involved here strongly evokes the real stuff. If you’re a parmesan fan, you’ll be pleased. Prosciutto di parma, mortadella and sopprassata. We also indulged in a salumi board. 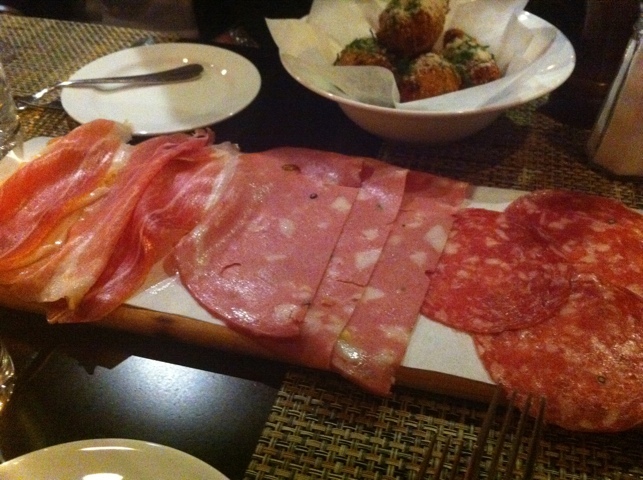 As you can see, we were served three slices of our choice of fare, we selected the prosciutto, mortadella dn sopprassata. Everybody likes a salumi plate, these were room temperature and pleasing, with a good (but not overwhelming) salt. 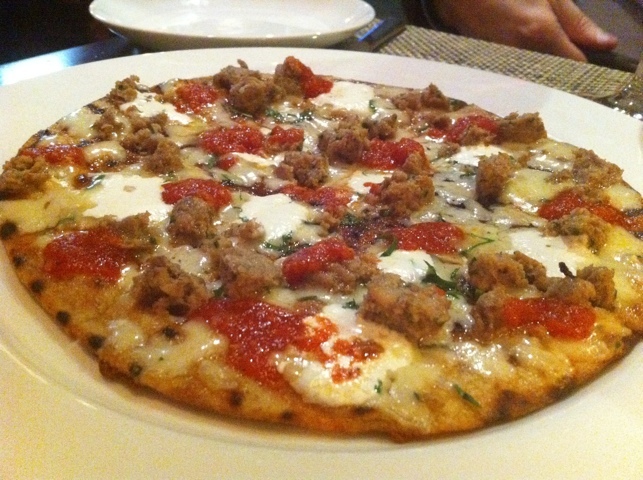 Following this decadent start, we sampled one of their pizzas. We’d previously had the robiola, black truffle pate and pecorino pizza (which we enjoyed), but when we heard they were serving a meatball pie as a special, we jumped on it. Their pizza crust is wafer thin and crispy. There are six slices to a pie, and they are more like an hors d’ouerves. Any individual piece could be held at the widest part of the crust between your thumb and index finger. Although we had already eaten a good volume of food, it was time for mains. My companion got the fettucine alfredo special. It was very rich. The fettucine was al dente. The overall preparation, via the sauce, had a slight stickiness to it, but it wasn’t unwelcome. I am a big fan of the tagliatelle alla bolognese. During a recent trip to Italy, my wife and I spent some time in Bologna, going to Trattoria Anna Maria. 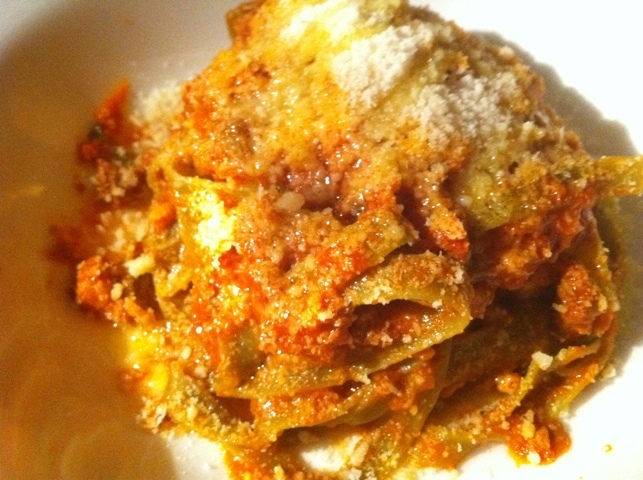 Trattoria Anna Maria is widely praised for being a purveyor of classic, authentic, typical Bolognese cooking. Anna Maria was in the restaurant when we were there. I was surprised when the plate they served me wasn’t a thick, red ragu but rather a lighter crumble of meat. Somebody at Accademia di Vino must’ve spent some time there (or in that region): their version is surprisingly authentic. Of course, it is impossible to discuss Accademia di Vino without talking about its extensive wine list (hence the restaurant’s name). Oenophiles will enjoy the selection, which is broken up by various regions. I was pleased by the selection of Barbera D’Asti wines, myself. All in all, the place lives up to Corwyn’s pedigree, and it’s welcome in the neighborhood.